I NEED TO CODE! » Planets! 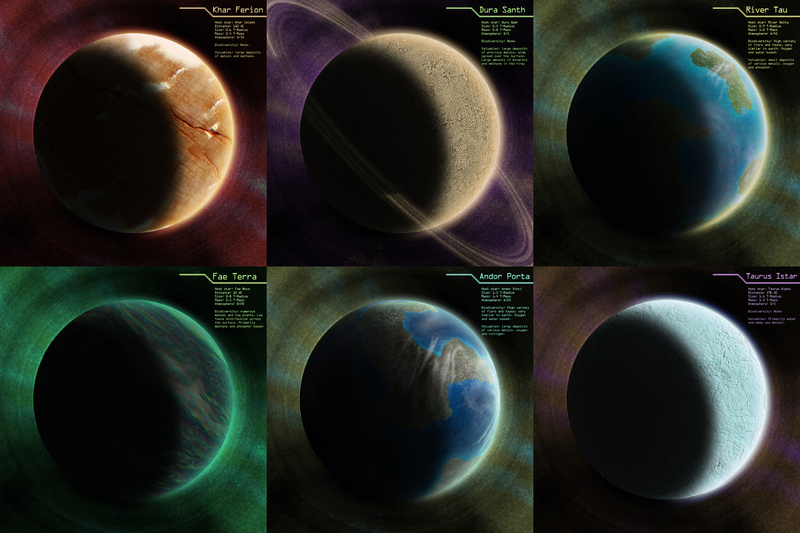 Got a workflow in photoshop to create planets quickly... well... non-earthly planets that is. First planet, Fae Terra, took about 3 hours, the rest only 15 minutes. Naturally I wanted an earth-like planet too, boy was that a pain to create. Many hours later searching tutorials, textures and fiddling around with colours I got a result I was fairly happy with. I tried to find a process using effects primarily that results in a planet where continents are separate shapes on the texture, match the ocean they drift in and look fairly realistic. For every planet you need some manual tweaking with the clone pencil and random strokes, blur and smudge to give more story to it, but the amount of manual work on the earth planets is much, much more than on the other planets without continents. After the continents looked good enough (for the time I spent on it), I did the clouds. These went a lot easier with a proper brush to create the sheepy clouds, and strokes + smudge to create the bigger bands. I could have player more with depth, but I really needed to finish it up. Credits due where credits due: all textures I used came from texturez.com. Free concrete and stone textures to define the surface of the planets.